What Type of Soil Do Olive Trees Live In? What Part of the Plant Is an Olive? When grown in the proper climate and soil, olive trees grow about 3 feet in both height and width each year. Most reach a full height of 25 to 30 feet. Plant your olive trees in soil that drains well. The olive will grow in almost any soil conditions, including acidic, alkaline, stony or sandy soils, but they require good drainage. Plant the trees in full sun, where they can get at least six to eight hours of direct light daily. Water the trees once a week for their first year. Thereafter, olive trees require almost no supplemental watering, tolerating drought and extreme heat with equanimity. Prune heavily to encourage the tree to grow into the shape you want. For a clean, straight trunk, cut off the lower branches up to the point where you want the tree to start spreading out. If you want the tree to have several trunks, tie the lower branches or the suckers that come up from the base of the tree to stakes positioned at the angles you want the limbs to grow. Olive trees (Olea europaea) tolerate numerous soils, from sand to clay. They perform best in fairly coarse, averagely fertile soils unstratified (having a single layer) to a depth of 4 feet. Requiring good drainage, they handle a soil pH range from acidic (5.5) to alkaline (8.5). Remove all dead branches or any branches that appear diseased. To cut large, heavy branches, make a 1/2-inch deep cut with your saw on the underside of the branch within 2 inches of the trunk. Cut straight down through the branch from the top side approximately 3 inches beyond where you made your initial underside cut. In this way, when the branch begins to break it will snap off where the underside cut was made without stripping large quantities of bark from the tree. Once the branch has broken off, simply cut off the 3-inch stub. Cut branches which are growing lower to the ground than you wish for the shape of tree that you desire. When cutting large branches always following the cutting directions in Step 1. Cut branches that are growing sideways through the canopy of the tree. Remove suckers, either using shears or by simply snapping them off with your hands. Suckers are smooth branches without true bark; they often grow from the roots or grow out of the trunk. Top the tree if desired by cutting off no more than 1/3 of the main trunk. Grow olive trees in climates with long, hot growing seasons in keeping with their Mediterranean heritage. Ensure sites are free from late spring frosts but sufficiently cold winter temperatures to set fruit, if fruit production is desired, with temperatures above 28-degrees Fahrenheit. Site your olive trees where they will receive full direct sunlight daily and are not shaded by canopy trees. Place fruit bearing olive trees away from hardscape to prevent staining and regular cleaning maintenance. Allow a planting location to accommodate the height and spread of your olive tree at maturity with a maximum height of 50 feet and a width of 30 feet unless you plan to prune it consistently. Plant multiple trees at intervals of at least 20 feet unless growing as an elevated tree hedge. Plant your olive trees in well-drained soil where water does not pool and with a neutral to slightly alkaline soil not to exceed an 8.5 pH. 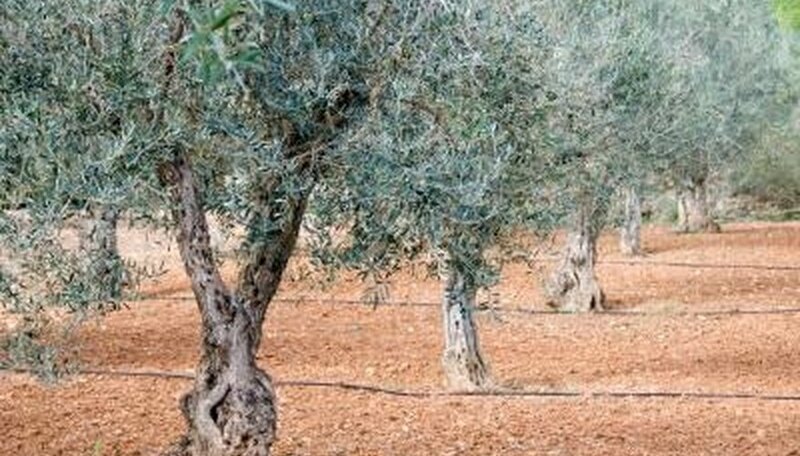 Plant near where irrigation is available as the natural climate range of olive will have dry summers making supplemental irrigation is necessary. The olive tree is a tree or shrub, depending on growth and pruning. It can be single trunk or multi-trunk. They have grayish green leaves that are 3 inches long, flowers are white and small. Flowers will bloom come spring, and the fruit is the edible olive that appears green in late summer and matures to be the black olive. It is a hardy tree/shrub to around 15degrees F. Tree/shrub damage may occur when the temperature falls below 15 degrees F.
Olive trees need full sun, low water, and a deep soil. They have high maintenance with their fruit and flower drops, and basal suckers will need to be pruned to keep contained. They can be propagated by vegetative cuttings. People in Crete have been using the oil of olives and cultivating the olive tree since 3500 B.C. The olive tree is the symbol of wisdom and peace. It was an olive branch that came to Noah in the Ark. 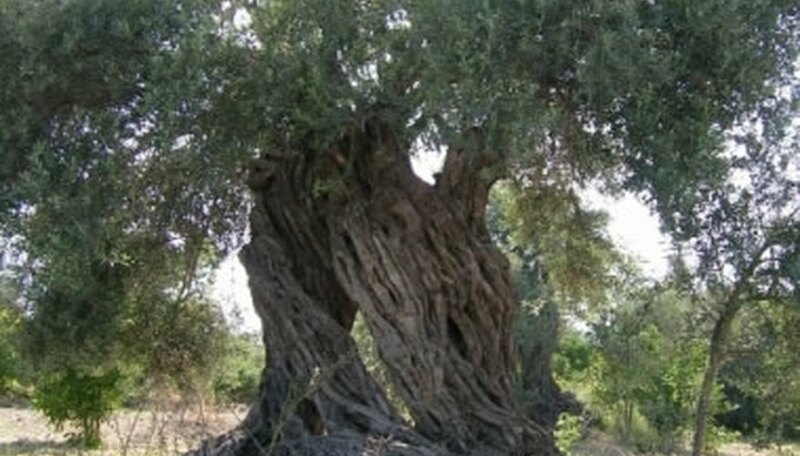 The olive tree is also a sacred tree of the goddess Athena in Greek mythology. A wreath of olive leaves is what is said to have protected Hercules in mythology. Olives are used in salads and sandwiches, as a martini garnish, and as prime ingredient in olive oil. Olive oil is a part of a healthy diet and a source of antioxidants. Olive trees hail from the Mediterranean, and so require long, hot summers and winters that stay above 30 degrees. These trees survive outdoors only in some areas of California and Arizona. They fail in colder areas, starting with a lack of blooming and fruit. Olive trees require full sun for eight hours every day if they're to bloom and bear fruit. Fruiting olive trees fail to bloom or bear fruit if they don't get enough sun. 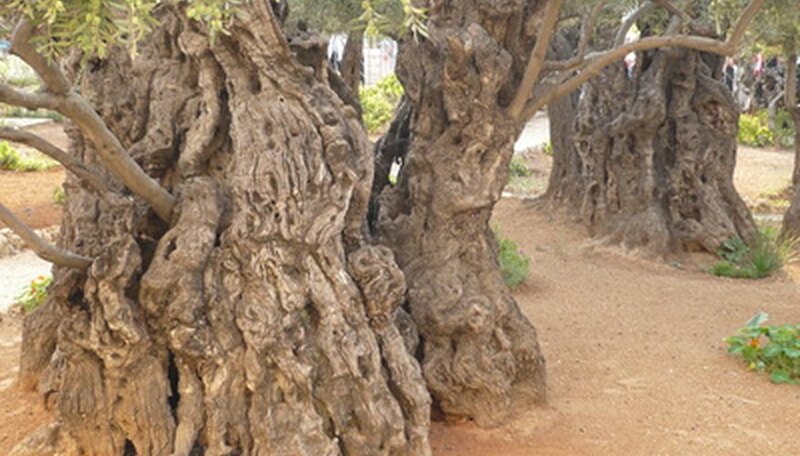 Olive trees need quick-draining soil, but can grow in poor, sandy foundations. They will fail in standing water or thick, muddy soil. If an olive tree is planted in the wrong soil, it doesn't have the resources to produce blooms or fruit. Some olive trees are decorative and don't produce fruit. Check their olive tree's variety before expecting fruit. Fruiting olive trees require deep watering of 8 to 10 inches at least once a month. Some farmers feed their olive trees nitrogen fertilizer in the early spring to enhance blooming and give the trees resources for fruit bearing. Dig a hole about as deep as your seedling's root ball is long and three times as wide. Because olive roots are fairly shallow, the soil around them should be loose and easy to penetrate. Choose an area in full sun with loose, loamy soil. Mix the soil from the hole with an equal amount of peat moss fertilizer. Release the seedling from its pot and untangle the roots. Gently set the seedling into the hole so it stands straight up. Spread the roots out in the hole to encourage them to strike out. Cover the roots with soil-peat moss mix and press down lightly. Water the tree with about 2 1/2 gallons of water on the first day and 2 1/2 more gallons on the second day. Water your seedling with 5 gallons of water weekly after that. When the olive tree strikes its roots, shown by new leaf growth, water with about 10 gallons of water every week and a half. Research olive trees and, if the conditions in your area are conducive to growing this type of tree, contact local garden centers and shop the Internet to order a sapling. Spread 3 cu feet of well-rotted animal manure over an approximately 9-by-9 foot area at the tree planting site. Spread up to 5 pounds of trace mineral dust such as Azomite over the same 9-by-9 foot area. Contact a local fertilizer company or a department of agriculture representative if you do not know the pH of the soil in which you are planting the olive tree. The ideal pH is 7.0 to 8.0. Lime can be added with the manure and mineral dust as needed to reach this level. Dig an area sufficient for the sapling's size. Plant the tree at the same depth it was in its original pot. Level the area with a hoe. Mulch the surrounding area approximately 5 feet from the tree's base with coarse straw to conserve water, cool the soil and hinder weed growth. Water the tree, but not to the point that it is waterlogged; excess water poses a threat to the health and productivity of an olive tree. Prune olive trees yearly in spring or summer when the tree is flowering. As the University of California Cooperative Extension points out, this will allow you to ensure that enough fruit will be produced after cuts are made. An olive is the fruit of an olive tree, according to California Rare Fruit Growers. Most olive trees start to bear fruit, or olives, at about four years of age.